Think of AI as a tool to scale humans, not to replace them. Companies and consumers are both captivated and frustrated by virtual assistants. They are dazzled by the ability of a Siri or a Watson to find just the right needle in the data haystack. But they are put off when other “intelligent” assistants prove to be anything but, offering searches that turn up the wrong things or leaving the user in limbo. 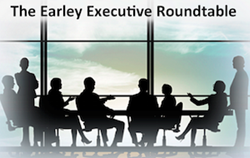 The challenges posed by today’s virtual assistants, and the potential of tomorrow’s smarter agents, were the subjects of an Executive Roundtable discussion hosted on July 20 by Earley Information Science Corp. (EIS), a leading consulting firm focused on digital transformation. The discussion, “Training the Robots: Evolving Virtual Assistants and the Human-Machine Partnership,” was led by Seth Earley, CEO of EIS, and Dino Eliopulos, Managing Director of EIS, and featured guest speakers Rowan Curran, an analyst at Forrester Research, and Manuel Ebert, a data scientist and founder of summer.ai. Today’s virtual assistants can provide huge advantages, the panelists agreed, but only if the relevant data is organized in the right way, the virtual assistants have been “trained” properly with the right technology, and humans are involved at sensitive junctures to make sure that the interaction with machines is as helpful and efficient as possible. Even if the language used by the assistant in the interaction is somewhat stilted, users will be forgiving so long as their goals are being met in a reasonable period of time. All that said, “we are at a very early stage” of development, Eliopulos noted. That makes it critically important to take full advantage of existing systems, said Curran. “We will get smarter over time,” Earley added, alluding to advances that will ultimately result in fully automated transactions conducted by intelligent agents equipped with natural language processing. The key to reducing current frustrations and producing more natural interactions is to understand that virtual assistants aren’t meant to replace humans but to augment them. Human-machine partnerships are needed, Curran said, as the systems move from “primarily taught to primarily learned” functionality. To access the roundtable, please use this link: http://info.earley.com/roundtable-virtual-assistant-human-machine-partnership Also see this related blog. About Earley Information Science: EIS helps organizations establish a strong information architecture and management foundation to drive strategic business outcomes and enhance operational performance. EIS has more than 20 years of experience in working with Fortune 1000 organizations globally across many industries. Corporate headquarters are in the Boston metropolitan area with consultants working on projects around the world. For more about Earley Information Science, visit our website at http://www.earley.com or contact us at info(at)earley(dot)com.